Disclaimer - I received information from Purex as an insider. I may receive a prize for this post, but all opinions are mine. Purex is giving away an amazing prize everyday for the month of August! 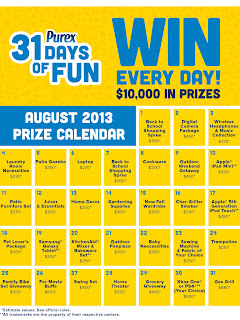 The contest 31 Days of Fun has some amazing prizes that you can win each day. In a few days, they're going to give away a swing set! My kids would flip out if we won that swing set! And since Purex really wants you to be excited about this promotion, they are going to give one of my readers a $10 Amazon.com gift card just for entering the 31 Days of Fun contest! To enter, head on over to Purex's Facebook page and like them! Enter their contest and then come back and enter to win my $10 Amazon.com gift card! Easy, and just think you could win both prizes!! Use the rafflecopter form to enter my contest. Good luck!